By appearing on the list, they are recognised for creating the most positive impact for their workers by B Lab, the non-profit organisation that certifies B Corporations and governs the B Impact Assessment. Service-led businesses are leading the way, as they make up more than 90 per cent of the list. Furthermore, many companies on the list are employee-owned brands such as Dansko,�King Arthur Flour and�New Belgium Brewing Company, and worker-cooperatives like Cooperative Home Care Associates,�Home Care Associates�and�Namaste Solar. "Study after study shows that being �best for workers� means being best for shareholders because the name of the game is winning the war for talent", said Jay Coen Gilbert, Co-founder of B Lab. 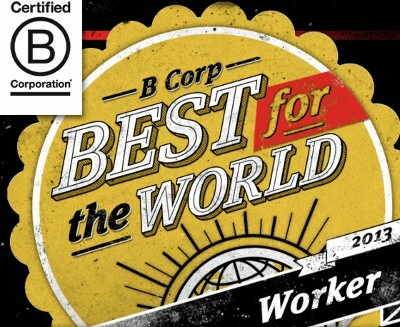 "The B Corp Best for Workers honourees are the companies people want to work for and invest in because they�ve proven they�re the best of the best by meeting rigorous, comprehensive third party standards people can trust." The Prestigious list honours companies that have received the B Lab certification for their positive impact on their workforce and scored in the top 10 per cent on measures from the B Impact Assessment. This is a comprehensive analysis used by more than 10,000 businesses to measure their impact on their workers, community and the environment. B-Lab, however, doesn�t survey employees directly, but companies get points if they seek feedback from their employees. But what makes a company a good place to work? The Worker Section of the B Impact Assessment looks at a company�s relationship with its workforce. It therefore not only examines worker ownership, compensation, benefits, management and worker communication, but the assessment also takes into account structured staff development programmes, the work environment and occupational health & safety. B Lab is a non-profit organisation that serves a global movement to redefine success in business. Its vision is that one day all companies will compete not only to be the best in the world, but best for the world. Certified B Corporations are new type of corporations that use the power of business for good and meet comprehensive standards of overall social and environmental performance, accountability, and transparency. Today, there are over 800 Certified B Corporations across more than 60 different industries and 27 countries. In April, B Lab recognised 67 companies as 'Best for the World' (overall impact); in June, 63 companies as 'Best for the Environment.' In November, B Lab will release a final 2013 list recognising companies as 'Best for Communities'.